LAURA LESSARD began studying the piano at an early age with her father, composer John Lessard and later with Ana Maria Bottazzi. She began her guitar studies at the age of thirteen in Florence, Italy with Stefano Michelucci. She continued her musical training at The Longy School of Music in Boston with Alfred Street and at The Manhattan School of Music with Sharon Isbin and Jerry Willard. 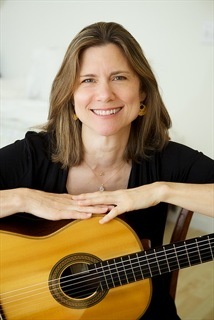 Laura has performed on both the guitar and lute throughout the Northeast and Canada, both as a soloist and chamber musician. In addition to her work as a performer she has been on the faculty of the Bronx House Music School, The Guitar Workshop, The Bay School of Music, the Songe d’été en Musique summer music festival, and The Usdan Center for the Performing Arts. She was a founding member and artistic director of The Oberon Foundation, a non-profit organization devoted to promoting the arts and artists on Long Island.